It has already become a running gag with my friends. At the housewarming party the other night, I was introduced to other guests as "he's the one taking empty suitcases to Switzerland so he can fill them with chocolates on the return". To my embarassment, this is mostly true - and has caused rather interesting discussions with Montréal check-in agents ("Sir, your bag is only 3kg?") and Zurich customs officers ("Sir, what is in this bag?" - "Err, nothing." - "Yeah right. Open it!" - "..." - "But, but... it's empty? Why do you bring an empty bag?"). 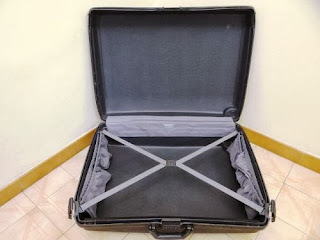 Over the years, I have somewhat refined my technique, and now balance my clothing more evenly between my primary suitcase and the bulk carrier. Beyond that, though, it is telling that I have started to bring an increasing amount of stuff eastwards over the Atlantic. As friends and family learn to take a liking to Canadian staples, more orders and gift opportunities present themselves. My next haul will not just include the obvious maple syrup and ice cider, but also lumberjack shirts from Roots, signature items from the Hudson Bay Company, and even Coffee Crisp. This quintessentially Canadian candy bar is the perfect red-white-red symbiosis: Made by Swiss giant Nestlé and sold only in the Great White North, it combines two of my favorite flavors into one confectionery, and is rapidly winning fans amongst the family. Or, as the ads put it: "How do you like your coffee?" - "Crisp!" Still, Switzerland remains a net exporter in my books. Canadian customs officers are more bemused than irritated when asking that same question about the contents of my bag. "Chocolates", I typically respond. "Oui, d'accord, but you declared $400. So what else?" - "Err, no. Chocolate. Lots. Of. Chocolate." At that point, a glance at my passport usually follows. "Ah, mais vous êtes suisse! Okay, no problem... welcome back!". Fortunately, there is no regulation on importing goodies other than a generous value cap, leading me to routinely raid Swiss grocery stores before any return. And with fresh meat and dairy products banned, that leaves mostly sweets. For good measure, I also pack my favorite toothpaste, and every now and then a new set of fitted sheets (comes with sleeping on a European-sized mattress in North America). Most frequent flyers scoff at the notion of ever using their extra baggage allowance, claiming that true road warriors always travel with carry-on bags only. But when ZRH shows up on my itinerary, I disagree. Others, too, have availed themselves to my hauling services: On my last trip, I ferried my goddaughter's loot from the outlet mall across the ocean. As if this wasn't enough, I seem to have accustomed her to one other kind of airfreight. One that says Canada like nothing else. One so precious and fragile that it will never go in my suitcase. One that I need to carefully guard as I carry it on the plane, with passengers and crew alike lusting for it. And one that I need to deliver to its merry recipient right after landing. For as its maker promises: It's always fresh.